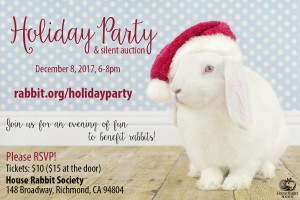 Join us at House Rabbit Society for our holiday party! 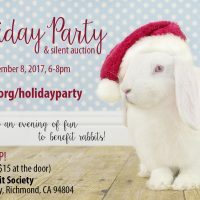 Featuring a silent auction with items donated from: Smuin Ballet, Amici’s East Coast Pizzeria, Bunfectionary, llc, Freight & Salvage Coffeehouse, Grand Lake Theatre, Hampton Creek, The Herbivore Clothing Company, Hiller Aviation Museum, Hornblower Cruises & Events San Francisco, Miyoko’s Kitchen, Primal Strips, Small Pet Select, Spa Organica, Vegan Essentials, Flat Bonnie, Funny Bunny Toy Company, Leith Petwerks, Sjaak’s Organic Chocolates, Rialto Cinemas Cerrito, Beach Blanket Babylon, Alternative Baking Company, and Karen Courtemanche of Harvest Home Animal Sanctuary. and visiting the rabbits of House Rabbit Society.